Why We Hurt and How We Heal - Solutions For Pain-Free Living! Your total Self-Care guide for healing backaches, headaches, shoulder pain, arthritis, fibromyalgia and chronic fatigue syndrome. After seeing his teenage daughter disabled with fibromyalgia, Dr. Greg Fors was compelled to return to academia to find answers for those whose lives are frustrated by chronic pain. 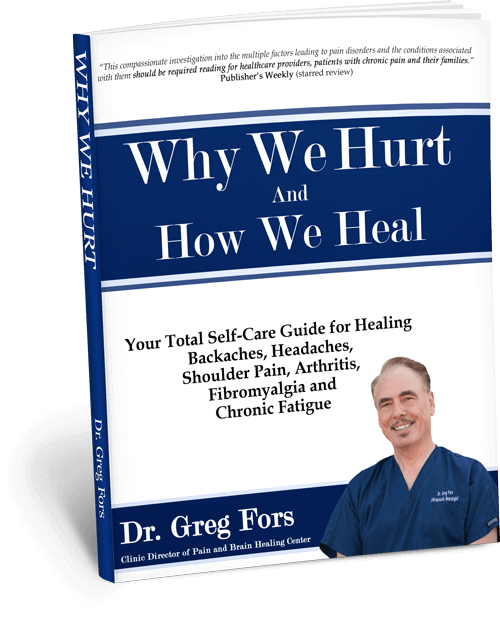 In this health and wellness book, Dr. Fors describes the development of chronic pain as a result of our lifestyle of convenience and the roadblocks put in place from our modern approach to healing. He discovered the primary culprits behind chronic pain are not only our diet and lifestyle choices but also the environmental toxins in our food, air, water, and cosmetics, as well as our own perceptions that lead to psychological stress. In this comprehensive, metaphysical approach to healing from the inside out, Dr. Fors dispels common misconceptions about conventional and alternative therapies and explains how the whole person must be treated―body, mind, and spirit. He prescribes a “triangle of healing,” with practical physical, nutritional, and spiritual solutions. This science-based alternative approach includes sound dietary recommendations, use of supplements, suggestions for healthy living, and proper detoxification strategies for living in a toxic world. Dr. Fors includes an entire section on self-administered therapy for myofascial trigger points, with diagrams and instructions relating to specific pain conditions. Most importantly, this approach puts you in charge of your health.